Christy Tennant Krispin's creative pursuits include writing, acting, speaking, and producing events related to the arts, culture, theology, and often a combination of any and all of the above. She has contributed articles for Christianity Today, The Curator, The High Calling, Discipleship Journal, Bible Study Magazine, Comment, and more, and she blogs regularly at Coffee Stains on my Bible and Algumwood. As an actor, she has appeared in numerous theatre productions and television shows, most recently playing "Truvy Jones" in a 2012 Seattle production of Steel Magnolias. 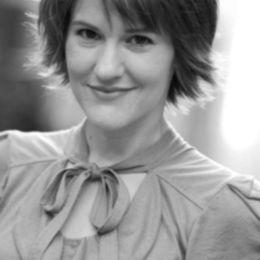 For her work as a podcast host (IAM Conversations, 2008-2012), Christy was described as "alarmingly talented" (Andy Crouch), "lively and friendly" (Byron Borger), and "effervescent" (Matthew Milliner), and as a consultant, she works with organizations throughout the US and abroad. In 2013, Christy and her husband held an exhibition of their private art collection and began advocating for an arts patronage model based on relationships between artists and patrons. Continuing to explore this passion, in January 2014, she will launch a new gallery serving a small group of artists and emerging art patrons. A New Yorker for over twelve years, Christy now lives in Seattle with her husband and their pets. On most Sundays, she can be found leading music (and occasionally preaching) at Mount View Presbyterian Church in South Seattle's White Center community.